Went in for a pint in early March waiting for a mate who lived nearby to get home from work. Bit of a mistake and the delightful frontage is false advertising to what awaits you when you get inside. Grim one room drinker, not very welcoming, full of local chavs f'ing and blinding and, to top it all off, one of the punters dogs took a sh*t on the sofa. I drank my pint quickly and left. Avoid. So the Pensioner is at it again. Another spate of time and another manager gone, mind you she had let the place go to rack and ruin. So its back, Admittedly only keg beers, Stella, Fosters Guinness etc but at very keen prices! £3.30 for Fosters, £3.50 for Stella? Ale is coming apparently. Cant wait! Meanwhile some local history adorns the walls (The Confessions posters and the Sharks head have gone, as has the dreadful smell of drains) and the young lady whose taken over seems keen to get it moving. Heres hoping! 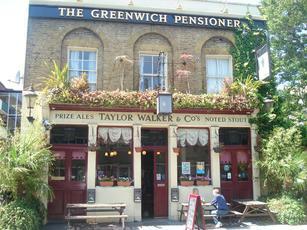 It doesn�t seem as if this pub has changed much since RogerB visited over three years ago. It looks might impressive from the outside � as you can see from the current photograph that I uploaded recently � with its original brewery facade and signage, and floral displays that give it a well cared for appearance. But it flatters to deceive, and the interior is very disappointing. There�s a pool table on the left; a sofa with a low cerise coloured plastic table; and a few normal tables and chairs comprise the furnishings. There are some bizarre decorations as well � the walls are adorned with advertising posters for the �Confessions� films, and there is a large false shark�s head on the wall to one side of the bar glaring down at punters in the pub! There was a TV showing a music channel, and the usual one-armed bandits and cigarette machines. In essence, it�s pretty characterless inside. What they didn�t have is anything worth drinking. There are two pumps; one had a clip turned round and the other advertising GKIPA which was not on. I always wonder why pubs leave a clip facing out when the beer in question is not on? It just leads to disappointment � not that I�m a great GKIPA fan, but it�s a darn sight better than the only other bitter (John Smith�s smoothflow) that they had on. I can�t see any reason to return. Looks great (on the outside). However, same old same old beers: Stella, Fosters, Guiness and quite bad bright lighting don't make it a welcoming place. It is family orientated, but don't expect to go for quiet pint. Children run around (relations of the owner) and toys are strewn across the tables. The paradox of this is the risque posters on the wall. an odd place, I would suggest passing this one by. As I previously informed you, the gang from the Brunswick are now in charge. London Pride @ �1.90. Carlsberg, Stella, Boddingtons and Guinness at affordable prices. Plus bottled Bombardier, Spitfire and Abbott. Karaoke on Thursdays, weekly quiz coming soon. Darts, pool, Sky Sports and music to entertain. Ideal for a quiet pint, or family gathering.